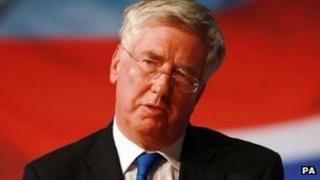 Image caption Mr Fallon has described fracking as an "exciting new energy resource"
Energy minister Michael Fallon has defended comments about fracking, in which he appeared to suggest the process would affect those living near gas drilling sites. Mr Fallon told a private meeting it would test "how thick their rectory walls are" and "whether they like the flaring at the end of the drive". In the past, he has described shale gas as an "exciting new energy resource". The Tory minister told the BBC his latest comments were "light hearted". His remarks, reported in the Mail on Sunday, were thought to be aimed at Spectator magazine journalist and former Daily Telegraph editor Charles Moore, who lives in a rectory in East Sussex and has written about his support for fracking. The comments came amid protests against potential fracking in West Sussex. Fracking uses high-pressure liquid pumped deep underground to fracture shale rock and release gas. Friends of the Earth said Mr Fallon's comments would "resonate across the UK and fuel more opposition to the government's disastrous support for fracking". "We need an energy policy based on cutting waste and developing the nation's huge renewable power potential - not one that wrecks our clean and pleasant land," a spokesman said. According to the newspaper, Mr Fallon, the MP for Sevenoaks in Kent, made the remarks after explaining that exploratory studies for fracking could spread across southern England following tests off the Lancashire coast. He is quoted as saying at the private meeting: "The second area being studied is the Weald. It's from Dorset all the way along through Hampshire, Sussex, East Sussex, West Sussex, all the way perhaps a bit into Surrey and even into my county of Kent. "The beauty of that - please don't write this down - is that of course it's underneath the commentariat. All these people writing leaders saying, `Why don't they get on with shale?' We are going to see how thick their rectory walls are, whether they like the flaring at the end of the drive." Mr Fallon said fracking would only be allowed if "absolutely safe". In an exchange with the BBC Mr Fallon confirmed he had made the remarks but said the newspaper report had "completely misconstrued a light hearted remark". He said "no fracking will be allowed in the Weald unless it is absolutely safe and the environment is fully protected". On Friday, energy company Cuadrilla began drilling for oil at a site in Balcombe, after being held up by more than a week of protests. Cuadrilla owns licences to test drill for shale gas in the UK but has said it has no plans to use fracking. But demonstrators from across the UK have gathered in the area saying they fear test drilling could lead to the search for shale gas and fracking at the site. In a separate development, Cuadrilla chief executive Francis Egan revealed he had received an anonymous email saying the company would receive "pipe bombs delivered by express mail to its premises" unless the company ceased its activities in the UK. "Fracking kills and so do we," the message said. A company spokesman confirmed Mr Egan incident had reported the message to police.